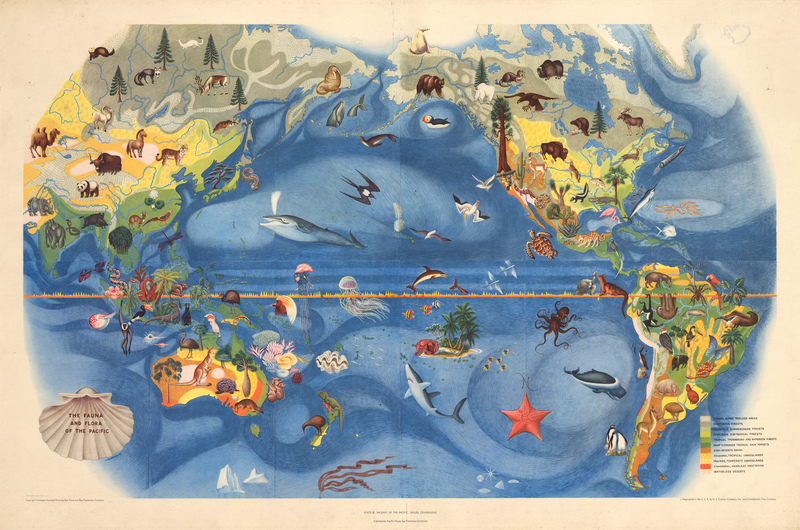 This vibrant pictorial map was published in 1940 for Pacific House of San Francisco. This is the second plate of a six-plate series entitled Pageant of the Pacific, which was ordered by the San Francisco Bay Expedition Company, for the Golden Gate International Exposition in San Francisco in 1939. The area covered by this map includes western Asia, Australia, Polynesia, and North and South America. Myriad vignettes of plants and animals embellish the continents and seas with fauna such as kangaroos, koala bears, ostriches, buffalo, yaks and pandas to name only a few land creatures. Whales, sharks, and octopuses are but a few examples of marine life populating the waters, while birds of all kinds are to be found on each continent and over the seas. The internationally known Mexican-born artist, Miguel Covarrubius, was commissioned to bring the idea to life. Born in Mexico City, Miguel Covarrubias moved to New York in his young adulthood, financed by the Mexican government. Once there he was immediately accepted by New York’s literary and cultural elite, often referred to as The Smart Set. A painter and caricaturist, theater set designer, ethnologist and art historian, he became well known throughout the world but especially in the United States, Mexico and Europe, with his artwork and celebrity caricatures having been featured in such publications as The New Yorker and Vanity Fair magazines. His work in ethnographic studies was significant. Condition: This splendid pictorial lithograph map is in A condition with a few minute dark spots in both upper quadrants. Printed on heavy, high-quality paper.